Bean and Ssam’s relationship is more than just Sun sign compatibility of Sagittarius and Capricorn. No individual is a pure Sagittarius or Capricorn but instead is a unique combination of signs and planets. The following interpretation defines the synastry or interplanetary aspects between the planets in Ssam’s birth chart and the planets in Bean’s birth chart. There is no evil planet in the combinations. No single combination can make or break the relationship. The list goes from the most harmonious (positive) to the most discordant (negative). Ssam’s Moon Trines Bean’s Moon (+9.95 harmony) – The couple’s individual emotional needs combine very comfortably. Bean and Ssam’s hearts and souls share a basic understanding of each other. There are sympathy and agreement in both big and small things. The dispositions and temperaments are the same between Ssam and Bean. Their moods are in harmony. They comfort and nourish each other naturally. This is an excellent booster if there are conflicts in other areas of the relationship. One of the best aspects to have in a serious relationship. Ssam’s Moon Conjuncts Bean’s Jupiter (+8.88 harmony) – Ssam’s emotional needs combine with Bean’s sense of growth, expansion, or generosity. The fusion encourages mutual confidence and respect in each other. Bean can be protective of Ssam and can be too indulgent at the same time. Ssam inspires and promotes Bean’s expansive aspirations. Even when things go wrong, Bean will not harbor any ill feelings toward Ssam. There’s a sense of luck and financial benefits from Bean to Ssam. This aspect is conducive to fertility and childbearing if the wife’s health and age can support it. Bean’s Moon Sextiles Ssam’s Venus (+7.86 harmony) – Bean’s emotional needs combine pleasantly with Ssam’s sense of sexuality, attraction, or intimacy. The relationship stimulates deep mutual devotion and affection in each other. Both tend to be liberal on financial matters. Bean and Ssam have common interests in many things including social activities. There is a strong attraction for love and marriage between Bean and Ssam. Ssam’s Sun Trines Bean’s Pluto (+7.27 harmony) – Ssam’s sense of identity, ego, will, and character combine very effortlessly with Bean’s sense of transformation, change, or power and destiny. Ssam can bring out the psychoanalyst in Bean. There is harmony in the relationship that helps each other grow as individuals. It stimulates enterprise and ambition in both Bean and Ssam. There is mutual interest in magical and occult knowledge. The positive effect of this influence can lead Ssam and Bean to a long-term relationship. Ssam’s Venus Sextiles Bean’s Jupiter (+5.54 harmony) – Ssam’s sense of sexuality, attraction, or intimacy combines pleasantly with Bean’s spirit of growth, expansion, or generosity. Both enjoy the same pastimes, cultural activities, and other forms of entertainment. There is natural stimulation in the relationship that brings out good qualities like optimism and self-confidence in each other. Ssam’s Venus Trines Bean’s Uranus (+5.04 harmony) – Ssam’s sense of sexuality, attraction, or intimacy combines very effortlessly with Bean’s sense of independence, freedom, and originality. There is harmony that brings out the latent creative genius in each other. A mystical or glamorous aura is present in the relationship. Bean surprises Ssam in one way or another. Ssam has a pleasant way of toning down Bean’s eccentricity. Ssam’s Mars Trines Bean’s Uranus (+3.78 harmony) – Ssam’s sexual drive, temper, and powers of self-assertion combine very effortlessly with Bean’s sense of independence, freedom, and originality. There is harmony in stimulating a productive sense of adventure. Both encourage confidence, aggressive drive, and initiative in each other. Ssam’s Mercury Sextiles Bean’s Mars (+3.60 harmony) – Ssam’s mentality and powers of perception combine pleasantly with Bean’s sexual drive, temper, and powers of self-assertion. Both stimulate the exchange of ideas and self-expression in each other. The relationship inspires a lively and productive conversation. Ssam’s thoughts and opinions are set in motion by Bean’s encouragement. Ssam’s Jupiter Trines Bean’s Uranus (+3.48 harmony) – Ssam’s sense of growth, expansion, or generosity combines very effortlessly with Bean’s sense of independence, freedom, and originality. Ssam’s visions are in harmony with Bean’s creative genius. Ssam will expand Bean’s goals and creativity. Bean adds innovation and excitement to Ssam’s projects. This aspect brings out humanitarian qualities in each other. Ssam’s Sun Trines Bean’s Saturn (+3.06 harmony) – Ssam’s sense of identity, ego, will, and character combine very effortlessly with Bean’s sense of commitment, necessity, or duty. There is harmony and natural respect for each other. Ssam and Bean are both willing to work out difficulties in their relationship. There is a mutual appreciation of responsibility and heartfelt commitment to one another. This aspect aids endurance in marriage. Ssam’s Jupiter Opposes Bean’s Jupiter (+2.46 harmony) – The individual sense of growth, expansion, or generosity confronts and challenges each other. There is tension in the moral sentiments, ethical principles, and spiritual values of Ssam and Bean. Both have different ideas of justice and fair play. Ssam’s Mars Sextiles Bean’s Jupiter (+2.39 harmony) – Ssam’s sexual drive, temper, and powers of self-assertion combine pleasantly with Bean’s sense of growth, expansion, or generosity. The relationship stimulates mutual helpfulness in achieving prosperity. Ssam provides a foundation for aggressive action for Bean’s dreams of development. This aspect is also favorable in business partnerships. Bean’s Sun Sextiles Ssam’s Venus (+2.04 harmony) – Bean’s sense of identity, ego, will, and character combine pleasantly with Ssam’s understanding of sexuality, attraction, or intimacy. The relationship stimulates the natural love for one another. Ssam has a soothing and warm effect on Bean. Bean has the desire to please and support Ssam. Both share the same social interests and enjoy the same pleasures in life. Ssam’s Sun Sextiles Bean’s Neptune (+2.03 harmony) – Ssam’s sense of identity, ego, will, and character combine pleasantly with Bean’s sense of spirituality, imagination, or mystical inclination. There is a stimulating spiritual bond between Bean and Ssam. A profound soul connection that makes falling in love with each other seems natural. Sometimes Bean knows what Ssam is thinking. Both share an interest in performing arts and metaphysical matters. Ssam’s Moon Sextiles Bean’s Uranus (+1.70 harmony) – Ssam’s emotional needs combine pleasantly with Bean’s sense of independence, freedom, and originality. There’s a degree of unpredictability linking Ssam and Bean. Both like and love each other in unexpected ways. Ssam and Bean are friends and romantic lovers at the same time. Bean awakens and inspires ideas in Ssam. Ssam’s natural instinctual mind stimulates Bean’s inventiveness and creativity. Ssam’s Venus Trines Bean’s Saturn (+1.39 harmony) – Ssam’s sense of sexuality, attraction, or intimacy combines very effortlessly with Bean’s sense of commitment, necessity, or duty. Bean’s protective trait is in harmony with Ssam’s loving nature. Trust is a rare and precious part of the association. This aspect is good for a long-term relationship. Ssam’s Venus Trines Bean’s Pluto (+0.87 harmony) – Ssam’s sense of sexuality, attraction, or intimacy combines very effortlessly with Bean’s sense of transformation, change, or power and destiny. There is harmony when both enjoy moving forward and growing through the relationship. There are feelings of relief and enlightenment after a relationship challenge. 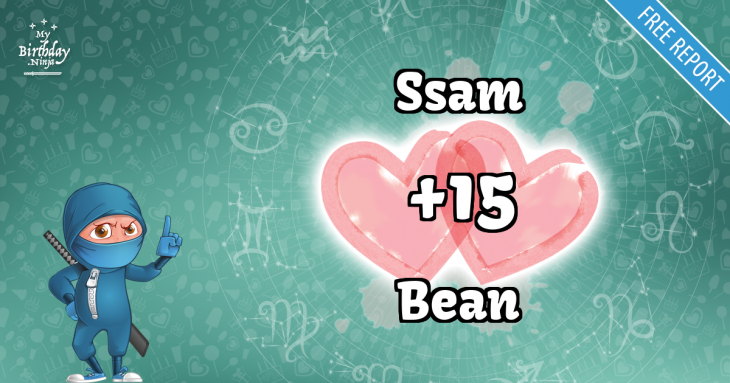 The magnetic attraction between Ssam and Bean makes it impossible to separate them permanently. Bean’s Moon Sextiles Ssam’s Mars (+0.59 harmony) – Bean’s emotional needs combine pleasantly with Ssam’s sexual drive, temper, and powers of self-assertion. Ssam stimulates Bean’s imagination and self-confidence. Bean inspires the development of Ssam’s sexual fire. There is physical intimacy, sexual magnetism, and irresistible passion between Bean and Ssam. This aspect encourages reproduction if Ssam is male and Bean is female. Bean’s Mars Trines Ssam’s Neptune (+0.45 harmony) – Bean’s sexual drive, temper, and powers of self-assertion combine very effortlessly with Ssam’s sense of spirituality, imagination, or mystical inclination. There is harmony in the equal exchange of sympathy and compassion. Bean helps Ssam fight procrastination. Ssam inspires Bean to more significant achievements. Bean’s Sun Conjuncts Ssam’s Moon (neutral) – Bean’s sense of identity, ego, will, and character combine with Ssam’s emotional needs. The encouraging and vitalizing energies of Bean connect with the comforting and inspiring strengths of Ssam. The fusion of powers is beneficial to a long-term relationship when supported by other aspects in harmony. Ssam’s Neptune Conjuncts Bean’s Neptune (neutral) – The individual sense of spirituality, imagination, or mysticism combines with ease within the couple. Both Ssam and Bean share the same tastes in art, music, or religion. The relationship encourages positive traits of creativity and dreaminess. It also has the tendency to promote negative characteristics of laziness or indecisiveness in Ssam or Bean. Ssam’s Moon Conjuncts Bean’s Neptune (neutral) – Ssam’s emotional needs combine with Bean’s sense of spirituality, imagination, or mystical inclination. The fusion offers strong compatibility with each other. A robust psychic connection exists between Ssam and Bean. Both have an affinity in mystical, esoteric, or even occult studies. There is a minor irritation when both seem distant or aloof to the other. Bean’s Venus Opposes Ssam’s Jupiter (-0.84 discord) – Bean’s sense of sexuality, attraction, or intimacy confronts and challenges Ssam’s spirit of growth, expansion, or generosity. There is tension on how each other will handle finances. Ssam may occasionally accuse Bean of not being entirely open and honest. Bean may accuse Ssam of being too open and honest. From time to time this aspect can bestow good luck. Bean’s Saturn Opposes Ssam’s Neptune (-1.50 discord) – Bean’s sense of commitment, necessity, or duty confronts and challenges Ssam’s sense of spirituality, imagination, or mystical inclination. There is tension in Bean’s domineering nature and Ssam’s anti-social or evasive behavior. Both might challenge their idea of reality and could end up hurting each other’s self-esteem. Ssam’s Sun Squares Bean’s Uranus (-2.00 discord) – Ssam’s sense of identity, ego, will, and character interact stressfully with Bean’s sense of independence, freedom, and originality. The rebellious nature of Bean produces friction with the selfishness of Ssam. There is a natural tendency to an on-off relationship. Bean might resent and even rebel against Ssam’s display of authority. This is subtle and challenging to deal with. The union can sometimes cause a violent reaction between Ssam and Bean. Bean’s Mercury Squares Ssam’s Uranus (-2.70 discord) – Bean’s mentality and powers of perception interact stressfully with Ssam’s sense of independence, freedom, and originality. There is friction when both minds meet. Ssam may seem unstable and erratic to Bean. Bean may seem elusive and contradictory to Ssam. Ssam stimulates, excites, and irritates Bean’s mind simultaneously. Bean can’t understand the complex mind of Ssam. Understanding and adjustment to each other are difficult to achieve in the relationship. Bean’s Jupiter Squares Ssam’s Uranus (-2.71 discord) – Bean’s sense of growth, expansion, or generosity interacts stressfully with Ssam’s sense of independence, freedom, and originality. There is friction in Bean’s aspirations and Ssam’s individualistic ideas. Ssam will seem rebellious or unstable to Bean. One or both will show extravagance and resistance to responsibility. Bean’s Jupiter Squares Ssam’s Pluto (-3.26 discord) – Bean’s sense of growth, expansion, or generosity interacts stressfully with Ssam’s sense of transformation, change, or power and destiny. There is friction in the individual aspirations, goals, and ideals. This can lead to misunderstanding or make cooperation difficult. It will be spiritually testing to Bean. Bean’s Mercury Opposes Ssam’s Jupiter (-4.46 discord) – Bean’s mentality and powers of perception confront and challenge Ssam’s sense of growth, expansion, or generosity. There is tension in the exchange of ideas in the relationship. Bean will seem petty to Ssam. Ssam might promise more than can be delivered. This is not a serious conflict if there are many harmonious aspects to the relationship. Ssam’s Mercury Squares Bean’s Uranus (-5.68 discord) – Ssam’s mentality and powers of perception interact stressfully with Bean’s sense of independence, freedom, and originality. There is friction when both minds meet. Bean may seem unstable and erratic to Ssam. Ssam may seem elusive and contradictory to Bean. Bean stimulates, excites, and irritates Ssam’s mind simultaneously. Ssam can’t understand the complex mind of Bean. Understanding and adjustment to each other are difficult to achieve in the relationship. Bean’s Mars Opposes Ssam’s Uranus (-6.28 discord) – Bean’s sexual drive, temper, and powers of self-assertion confront and challenge Ssam’s sense of independence, freedom, and originality. Both are strong-willed, and this causes tension in the relationship. Bean resents the quiet side of Ssam. Ssam dislikes the over emotional side of Bean. Both have an irritating effect on one another which in time can affect their health. Bean’s Mars Opposes Ssam’s Pluto (-7.67 discord) – Bean’s sexual drive, temper, and powers of self-assertion confront and challenge Ssam’s sense of transformation, change, or power and destiny. There is tension in each other’s resistance to display of authority by the other. Both can be vindictive toward each other. There is intense competition in the relationship. Bean’s Jupiter Squares Ssam’s Saturn (-9.07 discord) – Bean’s sense of growth, expansion, or generosity interacts stressfully with Ssam’s sense of commitment, necessity, or duty. There is friction in Ssam’s view of responsibility and Bean’s dreams of expansion. Ssam places too much responsibility on Bean. Bean feels confined and frustrated. Bean’s Moon Squares Ssam’s Mercury (-10.06 discord) – Bean’s emotional needs interact stressfully with Ssam’s mentality and powers of perception. There is friction in the mismatch of tastes and interests. Bean is hypersensitive and tend to misinterpret Ssam’s intentions. Ssam pays no attention or ignores the sensitive nature of Bean. Arguments and debates are common in the relationship. Ssam’s Moon Opposes Bean’s Saturn (-10.78 discord) – Ssam’s emotional needs confront and challenge Bean’s sense of commitment, necessity, or duty. The tension can easily create misunderstanding between Bean’s practicality and Ssam’s emotions. Both have opposite ways of handling everything from finance, lifestyle, and stress. Ssam resents Bean’s constant discipline. Bean is frustrated by the moody disposition of Ssam. Bean sees the conservative and safe side of any situation. Ssam sees the intuitive and magical side. Ssam’s Moon Squares Bean’s Mars (-12.77 discord) – Ssam’s emotional needs interact stressfully with Bean’s sexual drive, temper, and powers of self-assertion. There is friction when Ssam becomes indecisive when reacting to Bean’s impulsiveness. The relationship can show signs of intense physical attraction and a negatively smothering emotional reaction. Nagging, abruptness, and even refusal to calmly talk things over will be a frequent irritation in the relationship. Serious personality conflicts can exist between Ssam and Bean. Bean’s Mars Conjuncts Ssam’s Saturn (-15.65 discord) – Bean’s sexual drive, temper, and powers of self-assertion can combine with Ssam’s sense of commitment, necessity, or duty. The relationship induces cooperation and working for a common goal. Both either complement each other well or antagonize each other’s differences. Bean stimulates the ambition and progressive instinct in Ssam. Ssam in some ways restricts or limits the activities of Bean. There are 4 mutual receptions in Ssam and Bean’s planet combinations. Planets in mutual reception enhance each other. This will add +40 harmony to the total score. The remaining -1.95 discord is due to some minor aspects or planets in parallel. This is only a quick assessment of the relationship compatibility between Ssam and Bean. If both place and time of births are known, an in-depth interpretation is available in the Star Lovers Report. Try a free sample with no obligation to buy. Ssshhh! Ssam, don’t let Bean know. You are most compatible with a person born on January 11, 1994. You have a whooping birthday love match score of +210 with that person. Check it out and imagine what it feels like to be with your soul mate.